Today’s topics: What is spiritual direction? Is it for everyone? Summary of today’s show: Fr. Derek Borek joins Scot and Fr. Chris to talk about his work as spiritual director at St. John Seminary; to explain what spiritual direction is; how it is not just for priests and religious, but for all Christians seeking to deepen their relationship with the Lord; and how to go about finding a spiritual director. 1st segment: Scot welcomed Fr. Chris back to the show and asked him how his Fourth of July weekend was. They had a Mass at the seminary and Fr. Chris discovered that there are particular prayers for Independence Day. The Church acknowledges the good and prays for areas of growth. The prayers talk more about the nation and the work of the Holy Spirit uniting us together. Fr. Chris noted how people of diverse backgrounds are brought together on Independence Day. Scot said it was amazing how diverse the crowd was at Walden Pond in Concord, people speaking 10 or more languages. Growing up in Lowell, Scot heard from his Cambodian and Loatian classmates how precious America is to them. Fr. Chris was able to watch the fireworks from the roof of the rectory at Sacred Heart in East Boston. Scot watched the fireworks from Cambridge. Fr. Chris is getting ready to celebrate a Mass for the Missionaries of Charity on Thursday. They run a day camp for 50 or 50 young people, teaching them about the faith and Mother Teresa. The sisters provide a set of eyes and ears for the kids during the summer while their parents are working. Scot noted that today is his parents’ 42nd anniversary. 2nd segment: Scot welcomed Fr. Borek to the show. He asked him how came to his vocation. He hadn’t really thought about the priesthood growing up. In high school, he was greatly influenced by a Protestant friend with whom he discussed faith. He challenged Fr. Derek about what he really believed. So he questioned what he believed and it was in college that he started to sense God’s calling to the priesthood. He had a friend die suddenly in an accident and that made him step back and take stock. He became attentive to God’s presence in his life. At U. Mass Lowell, he got involved in campus ministry and the chaplains had a great influence on him. After graduating he went to the seminary. Fr. Derek grew up in Quincy and went to public school all his life. 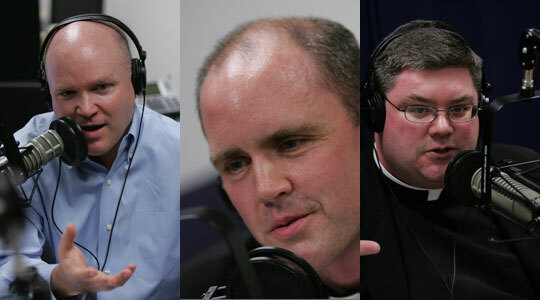 There is a diversity in the seminarians who come from public and Catholic schools. His decision to enter seminary was a practical decision. While he’d felt the call for 4 years, he had been resistant. He had no loans to pay off, had no girlfriend, didn’t have a job, or grad school lined, so he decided to take the chance and explore the option. Over the next five years, he grew in relationship with the Lord. Like many seminarians, he did not know for sure he had a vocation to the priesthood, but he was willing to discern that in the seminary. Seminary formation helps a man come to a greater understanding of the life and responsibilities of the priest and the best place to learn that is in the seminary. Fr. Chris said the faculty’s job is to help men figure out what God wants them to do. Discernment comes from God, from the men, and from the Church and if all three are saying that there is a call, then there is a clear indication. That’s an important part of the whole process. The men don’t sign their life away by walking in the door. Fr. Chris said a seminarian told him that he wished every Christian man could enter the seminary because even if they don’t become a priest they are formed in Christian virtue and gain the tools that would make them great fathers and husbands if not priests. His background helps him remember that men in spiritual direction will have uncertainties and he shouldn’t impose on them a sense that they need to have it all figured out. 3rd segment: In talk about spiritual formation, there are two different fora: the external forum and internal forum. The internal forum contains spiritual direction and it allows confidentiality because it is just between the spiritual director and the seminarian. External forum deals with aspects of formation that would be manifested in his demeanor, public person, and academics. Spiritual directions concerns the inner man. It also pre-supposes a life of prayer. The spiritual director is the third person in a conversation the person is having with the Lord. It’s not telling a man what to do, but primarily being attentive to the movement of the Spirit and helping understand more clearly what the Lord is saying to him, particularly the question of what is his vocation. Fr. Chris recalls having people come to spiritual direction, not knowing why they are there, and then as they talk revealing where the Lord is in their life. The spiritual director helps put the pieces on the table and discern where the Lord is active in their lives. It’s not just for seminarians. As they are ordained, the men are encouraged to find a spiritual director to keep them honest and accountable and to help direct the prayer life. Fr. Derek said the spiritual director is for discussing the seminarian’s relationship with the Lord in a deeper way than they might talk with a formation director. For example, on the issue of celibacy, as the man considers the reality of forgoing marriage and family life, it can have so many effects on the man as he copes with that idea. Or difficulties with academics or relationships with people around him that he feels discussing more confidentially. But first and foremost what’s going on in his prayer life. The Sacrament of Reconciliation can be part of spiritual direction, but it’s up to the seminarian. That would be ideal, because the relationship allows the director to advise in the most intimate details of life. But it’s important that each seminarian be able to choose his confessor. There is training to become a spiritual director. Fr. Derek went to a three-week program at the Institute for Priestly Formation. There were lectures coupled with role-playing as both directee and director. He found it nerve-wracking when they had to role-play before the class. The spiritual director begins the session with prayer, either led by himself or the directee. The latter allows something to come up for discussion from the prayer. Then he allows the seminarian to bring up what he sees as needing to be discussed and then they go from there. If there’s something from a past session that needs to be followed up, then Fr. Derek will bring it up. In some sense, it is really the Holy Spirit who directs. Scot said in Confession a priest can’t bring up previous confessed sins and ask how the penitent is doing it. In spiritual direction they definitely can bring up issues that come up in spiritual direction. The confidentiality is not the same as the seal of the confessional. If it’s working well, the seminarian will see improvement in his own life of grace. If he’s committed to his life of prayer, he will grow in knowledge of God, in the life of charity and virtue. Fr. Chris said it is a privileged position for him to see the hand of God working in other’s lives. Fr. Derek said when you can the Lord at work in another’s life, it helps him to appreciate the ways the Lord works in his own life as well. This was his second year at St. John’s. In his first year, he was the Dean of Men, working primarily in the external forum. In two years, he’s seen the two difference fora. As a spiritual director, he’s been able to get to know a number of the men even better. He’s able to see in a more specific manner how the Lord is at work in the lives of these men. It’s different than seeing it in the external aspects of their lives. It’s another thing to see it at work in their hearts. He has been admitted to a mystery, which is an awesome experience. Fr. Chris said he can only see the external signs of the man’s attitudes, but Fr. Derek can see what others cannot. Fr. Chris said the faculty votes on every man that goes through the seminary and make recommendations to their bishops. Fr. Derek does not vote and makes separate recommendations. Fr. Derek said he helps the men warm up to spiritual direction by helping them understand it’s a safe environment to talk. He is himself very guarded and careful in opening up to people. 4th segment: Scot said spiritual direction isn’t just for seminarians or priests, but it’s a helpful tool for everyone to grow in holiness. Fr. Derek said spiritual direction in the seminary is focused first on discerning vocation to the priesthood and all other aspects that fall under that. But spiritual direction in general is helping someone to grow in intimacy with the Lord. It’s for anyone seeking that deeper intimacy. It is a means of helping someone stay accountable to spending that time in prayer and being attentive to where God is active in their life. Fr. Derek began spiritual direction in college and his first spiritual director was a woman religious. In a sense, it’s just like what seminarians: an extra pairs of ears to help you determine what the Lord is calling you to and to see the Lord’s presence in your life. There priests and religious and even lay spiritual directors. It’s about finding the person with whom you’d feel comfortable talking to about the movement in your heart. They should be a holy person who can help. The directee brings their experiences in prayer and receives in seeing God’s hand in it. Fr. Chris has many lay people studying at the seminary in the Master of Arts in Ministry or the Theological Institute for the New Evangelization who are required to attend spiritual direction. These people will themselves be offering spiritual direction, even informally, when they return to their parishes, so it is important that they experience it themselves. It’s also important for them to be sure they are doing what they’re doing for the right reasons. People going through major life changes or struggles are prime candidates for spiritual direction. Fr. Derek said in the major moments of life, we can be more attentive. It’s difficult in the ordinariness of life to realize we need to grow more and more in holiness and to be more attentive. They encourage seminarians every day to make an examination of conscience to recognize the blessings they’ve received and to see the ways God was active in their life and then to be attentive to ways that they were not open to His grace. Spiritual direction takes that one step further, and instead of one day looks at larger parts of their life. Fr. Chris said in his own spiritual direction, he feels like about 75% of the time it’s more like coaching him where he needs to improve or reaffirm what he already knows. But there are other moments that are grace0filled where the spiritual director can open the eyes up to a whole new vista that he hadn’t even considered. 5th segment: Scot asked how someone would find a good spiritual director for themselves. Fr. Derek said they should look for someone who is themselves in tune with the Lord, with an active prayer life, and is growing in virtue as well. First, go to the pastor. HE might not be able to provide spiritual direction himself, but he would be a good resource to point you to someone who would be able to direct you. Or a religious community might be able to offer someone who can be a spiritual director. Fr. Chris noted the Oblates at the Shrine of St. Joseph in Lowell and the Franciscans at Arch Street in Boston. He said the person must be comfortable with the spiritual director and the relationship has to be based on trust and respect. Sometimes, you might need a new spiritual director to take you in the new directions you need to go. A good spiritual director will recognize it themselves and take that step first. Fr. Derek said the asks the directee to make a commitment of six meetings and at the end of those meeting they will reevaluate and determine whether this is something that is going to work from both perspectives. Each person needs to have a thick skin to recognize whether the direction is going to work. Scot said it sounds like the best way is to ask people in the faith you trust. Maybe you can take it to prayer and ask God to reveal where to go for a spiritual director.